Cycles of Observation, Analysis and Refinement in Montessori. This is our required spring parent meeting. At least one parent from each family must attend. Attendance counts towards your volunteer hours. Childcare is available for enrolled students. Please sign up at the front desk. Our front parking lot will be transformed into a gorgeous celebration of spring! Come get your annuals, perennials and beautiful hanging baskets just in time for Mother’s day. Purchase produce and veggie starts from the PCS farm. Middle School students will again be selling hot dogs, snacks, lemonade and beautiful, handmade goods. What is Parent Prom? More fun than your high school prom! This is your chance to come and mingle with other PCS members of our community! Come and let go, dance your heart out without the worry of high school judgment. Tickets will be on sale beginning Thursday evening at the Parent Education Night. After that, you can grab your ticket in the lobby before or after pick up until Saturday May 4th. Tickets will also be sold at the door.Tickets will be $10 each. Cash or check. Why do I need a ticket? Is this a fundraiser?? Nope, not a fundraiser, the ticket sales go straight to pay for the jungle juice. What do I wear to this thing? Whatever strikes your fancy…Value Village, Goodwill, Red Light, are great options for getting your groove on. The bigger the sleeve, the more the bling the better! What if I don’t like to dance? Sounds good, come anyway and chat it up. Can I bring my sister? Brother? Parents? Please! We’d love to meet them! How can I help?? Hey! Thanks for asking! We would love your help in providing some finger foods and desserts for the event. Here’s the sign up for helping out. Annual Pancake Breakfast and Talent Show! Come eat a hearty breakfast and watch a great show put on by the PCS students! Tickets are $5 and will be on sale in the gallery at pick-up and drop-off times the week before the event. Look for Talent Show sign-ups soon. Join us as we welcome acclaimed author Bonnie Rough for a presentation on her new book. Relevant for parents of all ages. Invite your friends: This event is open to non-PCS parents. Limited childcare will be available for enrolled PCS students, a sign up sheet will be at the front desk by Wednesday, February 6th. Books will be available for purchase from Phinney books. Wreath Making is a wonder filled annual tradition for all ages, especially our young ones. Organized independently by our 8th grade students in order to raise money to fund a class trip in the Spring, the event features wreath making with fresh greens, gingerbread house decorating, a bake sale, hot beverages, and an adjoining book fair organized by parent volunteers. Please bring cash and check. In the Big Room. Join Dorrie & the Board for a re-presentation of the Semble/Path to Purchasing information. Get your questions answered. Childcare will be available for enrolled students, please sign up at the front desk. Join a board representative for a re-presentation of the Semble/Path to Purchasing information. Get your questions answered. Join Dorrie & the Board to learn how we can establish a permanent home for our school. We need you! Beer, wine & soda provided, let us know if you’ll be there so have enough. Teacher trainer and founding teacher of the Hershey Montessori Farm School in Ohio, Laurie Ewert-Krocker, will give us a special presentation following her visit to our farm program. Childcare will be available for enrolled students, sign ups will be at the front desk as the event gets closer. Laurie has been a staff member at Hershey Montessori School for 25 years. She started on the middle school design team for the Huntsburg farm campus and program, served as Head Teacher for the Adolescent Program and then became Assistant Head of School until 2010. She holds AMI diplomas at the primary and elementary levels, a Bachelor of Arts in English from John Carroll University, and a Master of Arts in English from the University of Washington. Laurie serves as Pedagogical Director of both Middle School and Upper School programs. She is passionate about Montessori education, literature and writing. Laurie and her husband Jim have two grown children, both of whom attended Hershey Montessori. Elementary Parents, join your child’s teacher for an inspiring night of Montessori Philosophy. The topic for the evening will be preparing the classroom environment & aspects of the home for the growing Elementary child. Grab a cup of coffee and visit event tables to chat with volunteer coordinators and learn all about the great volunteer opportunities at PCS! Its a group effort to wash, sort and press the apples! Enjoy the fruits of this collective labor by sipping delicious cider. Bring: Picnic lunch, Utensils (all recyclables must be packed out with you), Picnic blanket, Cups for cider, A vessels so you can bring some cider home. Please leave pets at home. Come on out to Vashon for a family farm picnic! Bring a lunch and picnic supplies. Join farmers Bob and Jen for a tour of the property at 1pm. This is a wonderful way to see the farm and socialize with other PCS families. Please leave pets at home. Its going to be hot and sunny, so bring your hats and wear sunscreen! Open to new and returning PCS families only. All Primary students and siblings are invited to 2 Ross Park Playdates/Picnics this summer. These casual gatherings at our local park are a great way to reconnect with school friends and get acquainted with the newest members of our community. Bring a picnic or just come to play! Come to beautiful Golden Gardens and socialize with other Elementary families! Bring a picnic dinner and enjoy the summer breeze. Come learn about the next AMI Primary training course in Seattle. Mary Raudonis Loew has been working in the field of Montessori education since 1963 when she received AMI primary training in Washington, DC. She has 23 years of classroom experience and has established primary training courses in 3 different cities. Mary has assisted in the star up of numerous schools and has 11 years experience as a school director. She has offered workshops in all areas of Montessori pedagogy, and serves as an AMI consultant, examiner, and 3-6 trainer. She has a special interest in the development of programs for adolescents. She has a BA degree with a focus in education, psychology and creative writing. This is the first of two great family summer events at the farm. Bring a lunch and picnic supplies. Join farmers Bob and Jen for a tour of the property at 1pm. Join us for our last all-school event of the year! Perfect for all ages! Bring a blanket, food to share (with serving utensils) and your own plates, cups and flatware. We will provide water and lemonade. Please leave pets and squirt guns (of all varieties) at home. Join us for our spring Farm Work Party at the PCS farm. Projects for all levels. Every two years, Pacific Crest hosts a very special night to celebrate the true spirit of our community. The Starlight Auction brings together Pacific Crest parents, teachers, staff, and friends of the school. 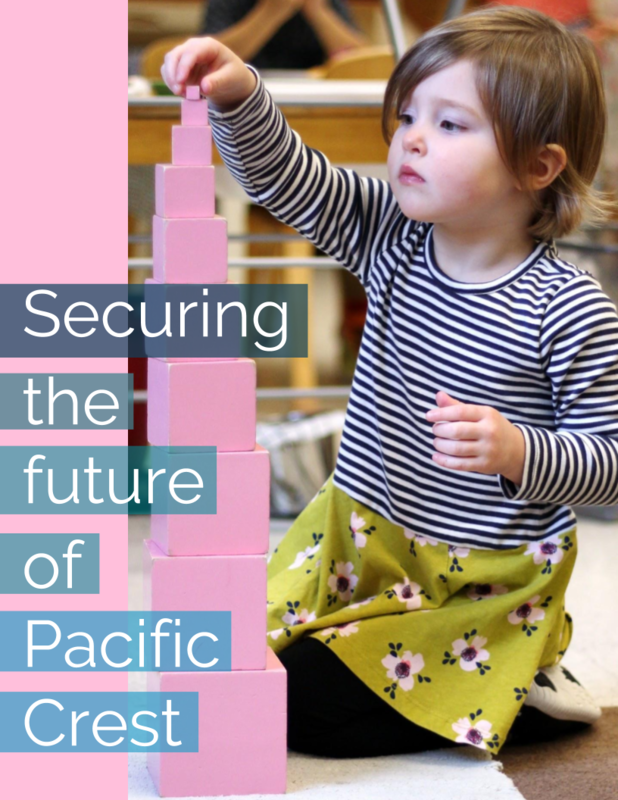 Money raised at the event allows Pacific Crest to keep tuition affordable while providing a valuable Montessori education for our children. Enjoy the aroma of juniper and pine while crafting wreaths with fresh greens! Build candy-covered gingerbread houses with the little ones from ready-made kits constructed by middle schoolers! Purchase delicious baked goods at the bake sale! All proceeds from this festive event support the Middle School end of year trip. Don't forget the visit the Book Fair too! Shop from your child's wish list and browse the selection of books, from children's literature to best-selling novels for all ages. This year, Phinney Books will be supplying books for all of our budding bibliophiles. If you haven't read their newsletter lately, you should. It's fabulous. Do some holiday shopping and enjoy the festivities! Please join us for a very important guest who is making a special effort to speak with all of us this Thursday night. David Kahn has been an extraordinary leader in the national and international Montessori community for more than 40 years. Reflecting deeply upon Montessori’s far reaching vision of education and peace, his work with schools guides us to refine our structures and processes so that we can bring Montessori’s vision to life. Our annual Pancake Breakfast and Talent Show is such a fun tradition. Breakfast is served at 9am, Talent Show starts at 9:30. Get your tickets in the main building a few days before the event. Join us for a fall picnic at our beautiful farm on Vashon Island! Bring a lunch, picnic blanket and utensils. Ferry service required.